Online-reservations are required with 100% pre-payment which is non-refundable in cancellation (shorter then 30 days before arrival) or change situations. If cancellation is made 30 days before arrival, only handling fee 50€ will apply. Cancellation fee 100 % (of the reservation) will be charged if the cancellation is made less than 30 days before the arrival or not at all. Hotelli Ujevaara is a small new hotel in the beautiful surroundings of Ivalo. 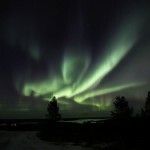 It´s located about 5 km north of Ivalo along the main road which leads far north to the Arctic sea and the North Cape.